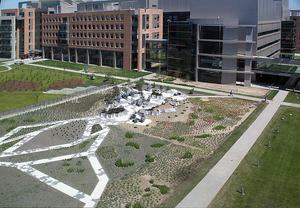 Opening October 1, This Garden At This Hour is the focal point of the renovated FDA Central Commons in Maryland. The sculpture is an assembly of cellular like modules in aluminum that represent the growth of organisms and rise into a series of cantilevered elements and arches that invite interaction with the public. The aluminum structures are intertwined into a planted landscape to suggest the idea of biological growth at different levels and scales.